Lots of applications and programs allow you to open them by dragging a file onto the application icon. The application will then open and load the file you dragged on. It is quite simple to add this behavior to your LiveCode standalones. 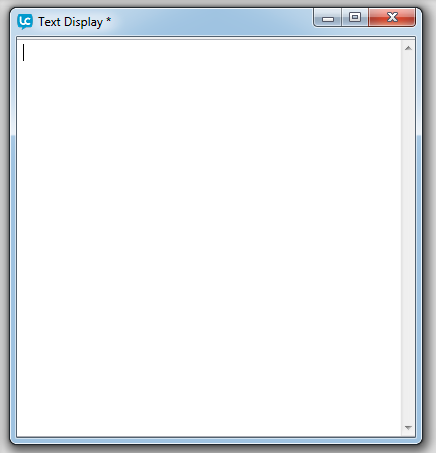 In this lesson we will show you how to create a standalone that displays a text file in a field when you drag a text file onto the standalone. 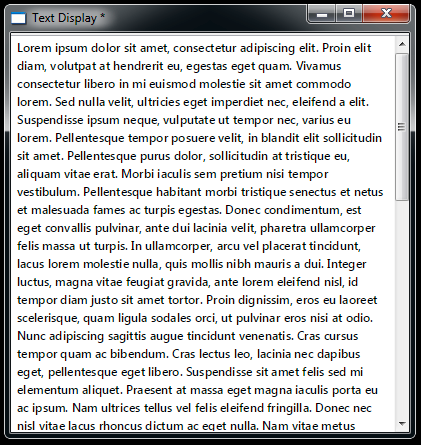 Firstly lets create a very simple stack, all we need is a scrolling field which we will use to display the contents of our text file. Windows standalones start up automatically when a file is dropped on to them. We use the $ keyword to get the name of the file that is dropped onto the standalone. The $ is used to indicate an environment variable on Unix systems and a command-line parameter on Unix or Windows systems. In this case we will use $1, when a file is dropped onto the standalone $1 contains the path to that file. put $1 into field "display"
We need to build a standalone to test our startup handler. Open the Standalone Application Settings from the File menu and choose OS X and Windows to build for. Leave all the other settings at the defaults. Then close the Standalone Application Settings and choose Save as Standalone Application from the File menu then choose where you want to build your standalone. Now go to the folder your standalone application was built in and open the Windows folder, now try dragging a text file onto Text Display.exe. The application will open and the path to the file you dragged on will be displayed in the field. We don't just want to display the file name though, we want to display the contents of the file so we need to include a handler that will put the contents of our file into the field. At this stage we also want to check that the file is a text file before we display it as our startup handler will accept any type of file. 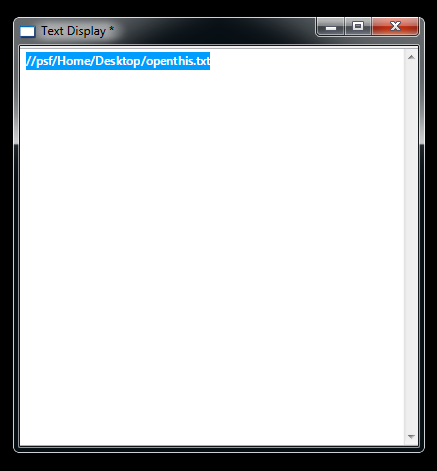 put URL ("file:" & pFileName) into field "display"
The build the standalone and test it again. On Mac we can't use the $ keyword to get the filename, instead we need to handle the appleEvent message. This message is sent to the current card whenever the application receives an Apple event. We check what type of appleEvent we get, if it is an open document event then we call our loadFile handler. There is another step we need to take in order for our Mac standalone to accept text files. We need to modify the preferences file within the application bundle to specify the file types our application accepts, in this case it is only text files. Within the application bundle go into the Contents folder and open the info.plist file. You can use a text editor or a plist editor. 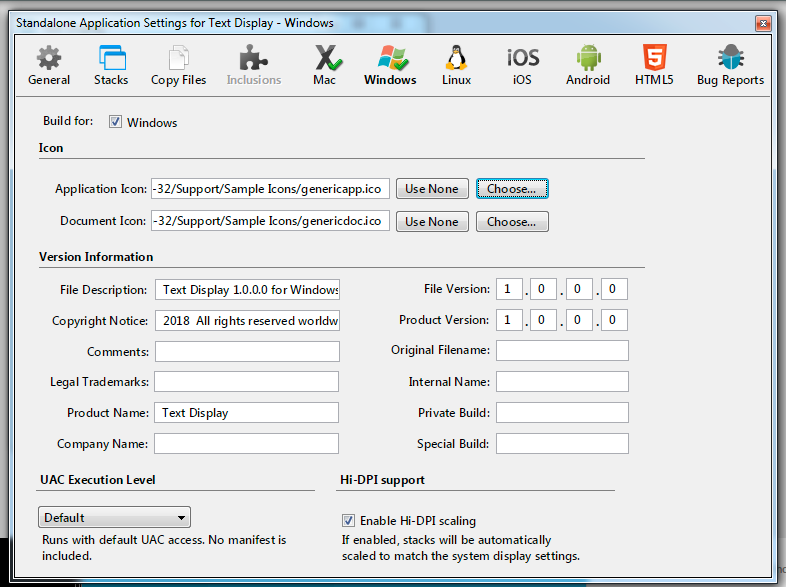 after the automatic CFBundleTypeExtensions created by the standalone builder. This states the application can accept files with the extension txt. If you want your application to accept other file types you need to add a CFBundleTypeExtensions entry for each allowed type. open .app --args "This is what I want to show up in that nifty display field"
What do i have to enter if i want my application to accept all file types? Is there something like a wildcard i can use? What macOS sandbox permissions allow LiveCode to actually open the text file that has been dropped onto the app? In my experience, this code works until you sign your macOS app and then it ceases to function. The sandbox doesn't recognize that the user dragged the file onto the app to open it. If all you need is the filepath you could just use a field, if a file is dropped onto a LiveCode field the default behavior is to display the path in the field. Thanks for the help! I'm actually trying to get EOS Utility (Canon Camera Software) to use my app as a linked app to open newly downloaded camera files. I only need the filename. I've got it working on Windows using on startup with $1 and on relaunch. Now on the mac. If I use an on appleEvent it gives me the path when dropping an image on the standalone icon, or when associating the file from the finder, but EOS Utility gives me an error "The application can't be launched" So I'm missing something in communicating through apple events somehow. Here's what I've been playing with. Is there another way to do something like this? put tfilename into field "Field1"
put tfilename after field "display"
I wonder if the EOS Utility doesn't see your app as something 'allowed' to open files. If the app is not receiving the apple event it may be that it needs to be linked to the EOS Utility somehow, perhaps there is a setting in the Preferences?